Once upon a time the Houston Astros were a yearly visitor to a magical land known as the Major League Baseball Postseason. Looking at the past few years that statement may seem like a fairy tale but I assure you it is true. One need only look in the record books to see for themselves. From 1997 to 2005 the Astros only missed the postseason three times and captured the National League Pennant in 2005. 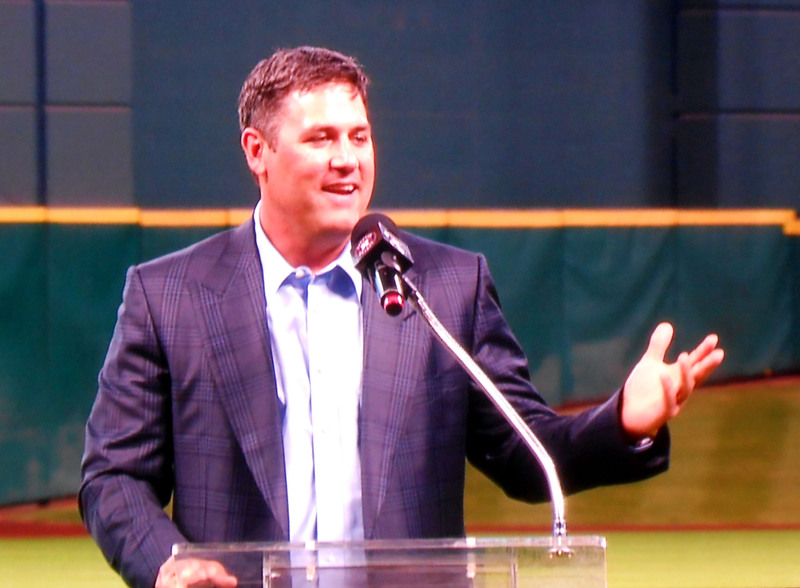 Long Time Houston Astro Lance Berkman retired during a pregame ceremony Saturday night at Minute Maid Ballpark. Granted, it has been eight years and counting since the last postseason appearance by the Astros but during those heydays of yore men like Lance Berkman and Roy Oswalt gave the fans something to cheer about as they packed into Minute Maid Park shoulder to shoulder. Saturday night the fans were once again chanting for Berkman and Oswalt as both men retired from Major League Baseball as members of the team that drafted them by signing one day contracts. The ceremony was certainly bittersweet for many of the long time fans who donned their Berkman and Oswalt shirts once more as they watched the two men ride off into the sunset during a pregame ceremony. 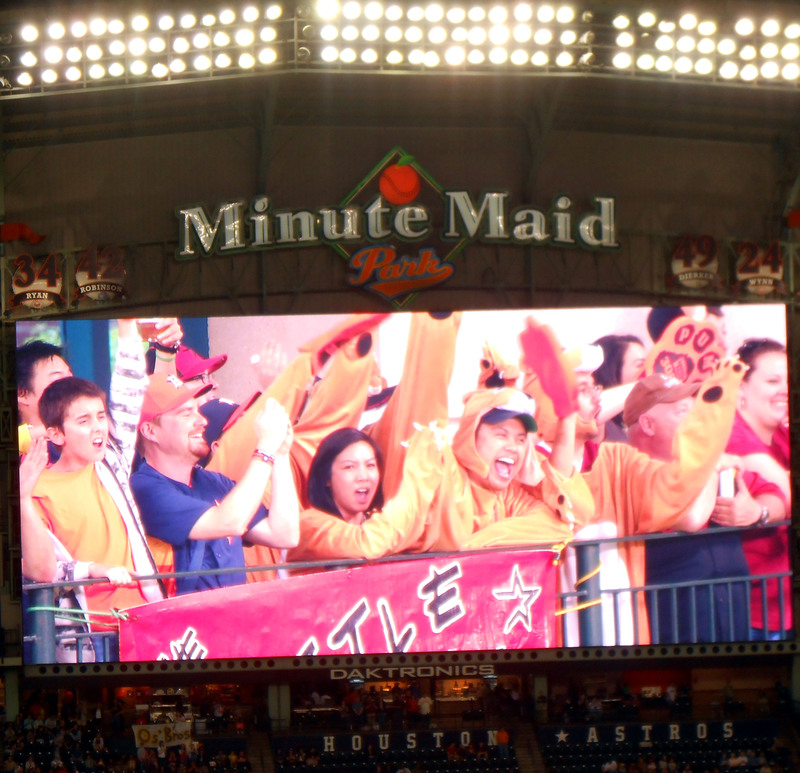 During much of his time in Houston Lance Berkman’s biggest fans the Little Pumas stood in the outfield in their furry puma suits. Saturday night the suits came out of the closet for one more time. The Little Pumas, a group of fans dressed in puma suits in honor of Berkman’s nickname, “the Big Puma” even dusted off their furry puma suits and took their place in the standing room only area in center field for one more time to say farewell. In addition to standing ovations and tributes from the fans both men were presented with Stetson hats, a rocking chair and perhaps more importantly framed jerseys from the 2005 World Series. After being traded from the Astros to the Yankees Berkman went on to win a World Series ring with the St. Louis Cardinals before playing for the Texas Rangers last year. Although Berkman is a World Series Champion I am sure he would have preferred to do that with the Astros. Roy Oswalt joined Lance Berkman in retiring as members of the Houston Astros Saturday night. During the ceremony notable accomplishments for both players were recited and it was clear that they had successful careers but despite that success both men were quick to point out that the success did not come without sacrifice. While the Astros will likely return to the postseason at some point watching them lose over 100 games year after year can harden even the most diehard of fans. 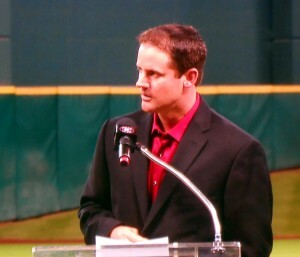 Very much aware of this fact, Berkman used a portion of his time at the podium to encourage the fans in attendance to “make the rafters shake” not for him, but for the current roster of players, many of whom were not even old enough to drive the last time the Astros were in the Postseason. Lance Berkman and Roy Oswalt threw out the ceremonial first pitches after a pregame ceremony honoring them for their time with the Houston Astros. While the fans cheered for the new guys it was clear that for many of the fans their hearts still belong to the players they grew up watching. Perhaps no where was this fact more evident than from a woman a couple rows up from me who squealed like a preteen at a Justin Bieber concert when highlights of Berkman’s career were shown on the ballpark screen known as El Grande. For the record I have never heard a preteen scream at a Justin Bieber concert but I am guessing the sounds are pretty comparable to what I heard at the ballpark. Berkman, Oswalt and I pretty much all arrived at Minute Maid Park at the same time so they were two of the players that I followed when I first became a fan of the Astros. As mentioned before I was at the Ballpark the day that Berkman was traded to the Yankees and while I know players are traded all of the time the Berkman trade seemed different since I had fully thought that he would be given the chance to retire as a member of the Astros. 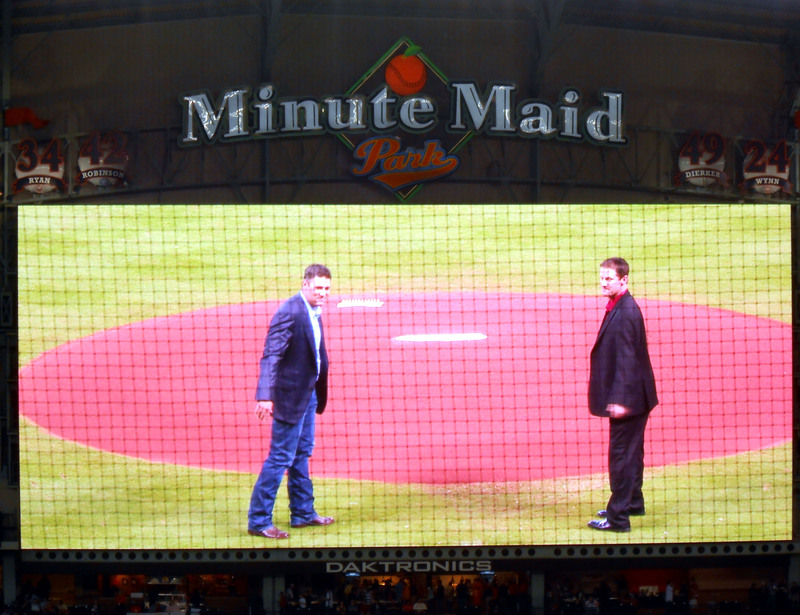 Roy Oswalt was presented a framed jersey from the 2005 World Series during a pregame ceremony at Minute Maid Park Saturday night. In the end after playing for three other teams Berkman came back home if only for a day to retire with the Astros but I can’t help but think that his presence the last couple years around the young players would have greatly benefited the team. But roster turmoil is part of the game and very rarely do fan favorites get to stay with their team for their whole careers. Craig Biggio, Cal Ripken, Jr. and Derek Jeter are certainly the exception more than the rule. Players come and go. Logos and team colors change but the game goes one just as it has for generations as each group of players and fans contribute a stanza to the baseball sonnet. After throwing out the first pitches to a pair of former teammates Berkman and Oswalt left the field for most likely the final time to the roar of the crowd to enter their post baseball lives. 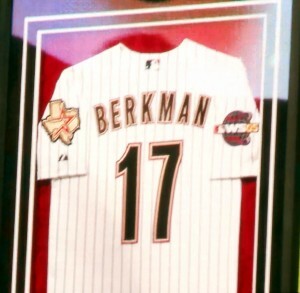 Lance Berkman was presented a framed jersey from the 2005 World Series during a pregame ceremony at Minute Maid Park Saturday night. Oswalt is going to become a consultant for his long time agent and Berkman is rumored to be on the short list replace Wayne Graham at Rice University as the head baseball coach in a few years. Of course, the players may also come back to Minute Maid Park someday to see their numbers retired and hung up in the rafters with the other team greats. But even if they do not have their numbers retired they will still have given a generation of fans years of memories to look back on while they wait for the next generation to complete their stanza. As for that next generation of Astros they ended up losing the game Saturday night but did come back to win on Sunday afternoon. Now if you’ll excuse me, I need to put my Puma shirt back in the closet. The salute to the retirement of Derek Jeter whistle stop tour kicked off the other night at Minute Maid Park prior to a game between the Houston Astros and the New York Yankees. 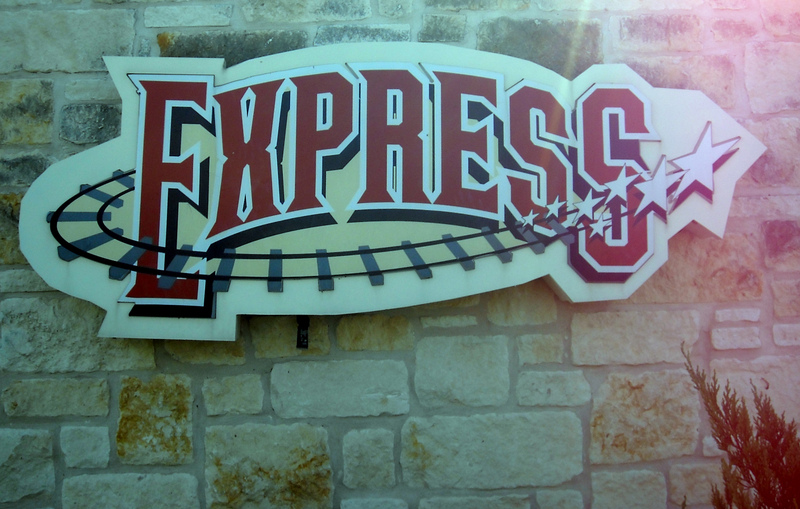 In a way it is almost fitting that such a tour would kick off at the site of a former train station. The season long farewell to Derek Jeter whistle stop tour kicked off at Minute Maid Park located at the former home of Houston’s Union Station. For those who perhaps had not heard Derek Jeter, the long time New York Yankee shortstop, is retiring at the end of the year to pursue whatever it is that a long-time Yankee does after hanging up his bat and glove for the final time. So much like last year, when Mariano Rivera was having a year-long retirement salute, each of the teams to host Jeter and the Yankees this season will present gifts as a sign of appreciation for what he has done for the game of baseball. Aside from being the player that they should have drafted way back when, Derek Jeter really does not have any ties to the Astros. 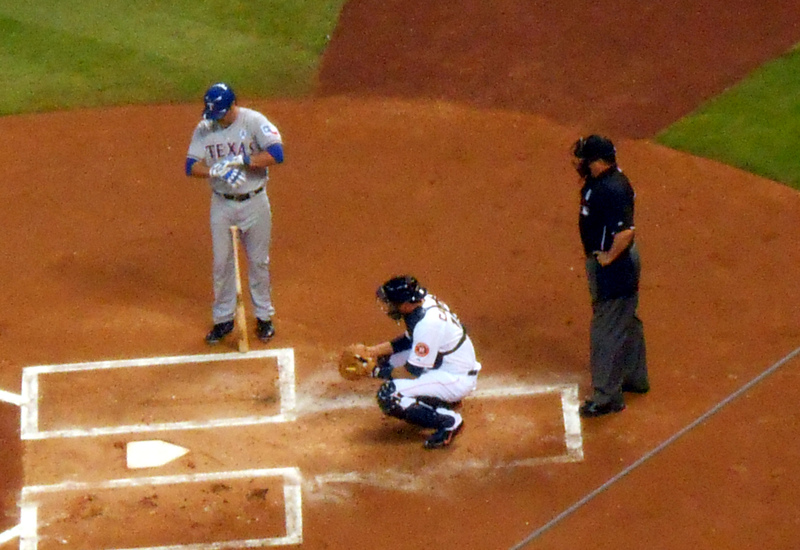 There are other stops on the farewell tour where teams have even less of a “connection” to Jeter. But just like clockwork each stop will feature pregame ceremonies with gifts and “grip and grin” photo ops for the fans of “insert city name here” to pay their last respects to Derek Jeter. Derek Jeter never wore the Astros uniform but the captain in pinstripes was bestowed gifts the other night anyway. Gifts given by the Astros to kick off the bon voyage included custom made pinstripe boots, a cowboy hat and some golf clubs. As far as the Astros go they have the distinction of being the last stop on the Mariano Rivera farewell tour last year and the first stop on the Jeter bye bye bonanza this year. On the surface I have no trouble with teams saluting players. 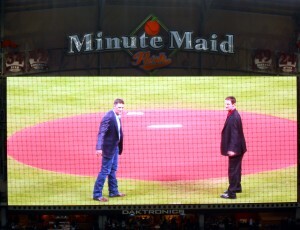 In fact, I am going to see two former Astros, Lance Berkman and Roy Oswalt, honored before the game tomorrow night. While I am sure there will be some gifts given to them it will only be a one ballpark stop and will not feature a prolonged tour through the rest of the Major League Baseball ballparks. Also, unlike the farewell to Jeter, the Berkman and Oswalt retirements will be occurring in front of the hometown crowd. Despite being traded from the Astros a few years back, Berkman and Oswalt are scheduled to sign one-day contracts, say a few words and then ride off into the sunset as retired ballplayers for the team where they spent the bulk of their careers. Lance Berkman spent Opening Day last season as a member of the Texas Rangers playing against his old team in Houston. Berkman along with Roy Oswalt will retire together as Astros tomorrow night in front of the home town crowd. I am a huge fan of the one day contract sign and retire approach as it allows fans to say a final goodbye to long time players while also giving the players closure on their career. In fact I think the baseball collective bargaining agreement should be written to ensure that all retiring ballplayers are given a one-day contract to retire with the team where they spent the bulk of their careers. I am less of a fan of the season long farewell tours where teams are “strongly encouraged” to honor players who may have spent very little time in that particular visiting ballpark. Most players do not have a year-long farewell tour as the majority of players do not get to choose when to hang up the cleats. In Lance Berkman’s case he retired after his body told him in the off season that it could not handle the strain of another season. 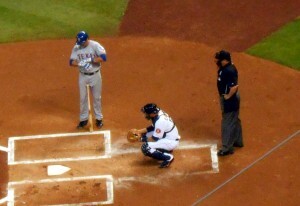 In reality it had been a few years since Berkman had played healthy all year so the signs were still. Oswalt finally called it a career after a few subpar seasons where the “Wizard of Os” didn’t have as much zip on his pitches as he once did. But aside from getting honored by the team where they played the bulk of their careers tomorrow night there were no gifts showered down from opposing teams to usher in the retirements of Roy Oswalt and Lance Berkman. And there certainly were not Lance Berkman and Roy Oswalt jerseys for sale in opposing team’s Ballparks as was the case this week at Minute Maid Park with Jeter merchandise available at the Astros team store. Don’t get me wrong, Derek Jeter was a fine ballplayer who never seemed to get caught up in any of the performance enhancing drug scandals or any other issues that would tarnish his reputation or the reputation of the Yankees or Major League Baseabll. One need only look to Jeter’s former infield partner, Alex Rodriquez, to see a player who seemed to do things the wrong way. By all accounts Derek Jeter is one of those players for the kids in Little League to look up to and immolate but does that rise to the level of making his jerseys available in every ballpark and bestowing lavish thank gifts on him? I am not sure. Like Derek Jeter, Cal Ripken, Jr. spent his entire career with the same team. Like Cal Ripken, Jr. Jeter is likely a first time ballot Hall of Famer. Cal Ripken, Jr. was another player who like Jeter did things the right way on and off the field. Like Jeter, Ripken spent his entire career with the same team which is becoming more and more of a rarity. But even as much as I like Cal Ripken I still have issues with a season long farewell tour. That does not mean that you cannot respect the player for being an ambassador for the sport. Opposing fans should even feel that they can give a little cheer when said player is up to bat but creating an environment where teams are left to one up each other when it comes to bestowing gifts on opposing players is a trend that needs to go. The Yankees last home game this year will be against the Orioles. In the spirit of season long tributes perhaps Cal Ripken, who spent his entire career with the Orioles, will be on hand in some way to send Jeter off into the sunset. Barring a playoff run for the Yankees Jeter will end is career at Fenway Park against the Yankees’ bitter rival the Boston Red Sox. I can only imagine the parting gift that they will give him. Now if you’ll excuse me, I need to go look for my Berkman jersey for the game tomorrow night. As the Houston Astros approach the 1oth anniversary of their last trip to the postseason two members of their 2005 World Series team have announced their retirement. While Roy Oswalt and Lance Berkman were each traded from the Astros years ago as the team entered a youth movement, both men will be given the chance to be Astros for at least one more day in a sign and retire ceremony on April 5. Over the past few years it has been commonplace for teams to hold these ceremonial retirements as a way for players and teams to reunite and allow the player to officially retire as a member of the organization where they spent the bulk of their careers. The ceremonies also give a chance for the fans of the players to say one final good bye to players that they used to root for. And as a special treat the Astros have announced that a commemorative item will be given out at the gate to recognize the event. 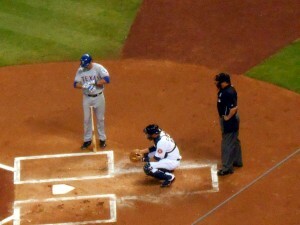 Over the years I attended many games that Oswalt and Berkman played in and of the two I was a bigger fan of Berkman’s. Even after he was traded I would still cheer for Berkman when he would visit Minute Maid Park and bat for the opposing team. Of course there were fans that would boo him as well which I never really understood. Lance Berkman, who spent last season with the Texas Rangers, will sign a one day contract to retire as a Houston Astro on April 5 along with former teammate Roy Oswalt. If you like a player it should not matter what color his jersey is since he is still the same player you once cheered for under it and many players do not get the choice of where they are traded to. Speaking of trades, I was actually at Minute Maid Park on the day that Lance was traded to the New York Yankees. This was the start of the Astros trading away all of their players to get younger but for some reason it felt like Berkman would be safe. After all he was a hometown player who went to the local university and had played his whole career with the Astros. But on that day as the texts started rolling in, and the whispers that he had been traded turned to screams of disbelief it was apparent that the Astros were entering a new era where no player, no matter how popular, was safe. It was also the day when the college kids who spent every game dressed up in their puma suits in honor of Berkman’s nickname, the “Big Puma,” took them off for the last time and tried to make sense of what had happened. I had envisioned Berkamn getting to be like Cal Ripken Jr. who grew up in Maryland and played his entire career with the Baltimore Orioles before retiring on his own terms. 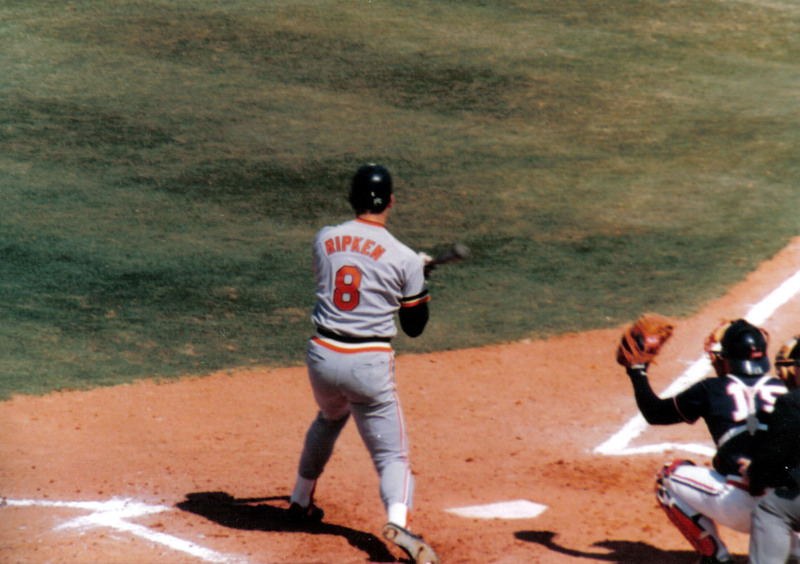 Of course, Ripken was a first ballot Hall of Famer from a generation of players that we just won’t see repeated. In fact Derek Jeter, who has spent his entire career with the New York Yankees, very well could be the last player to spend his entire career with a single organization. Baseball is a changed game and even players with dedicated fans who dress up in puma suits are not spared the trade deadline ax. Of course on April 5 those puma suits can be dusted off as the “Big Puma” comes home for one last time. 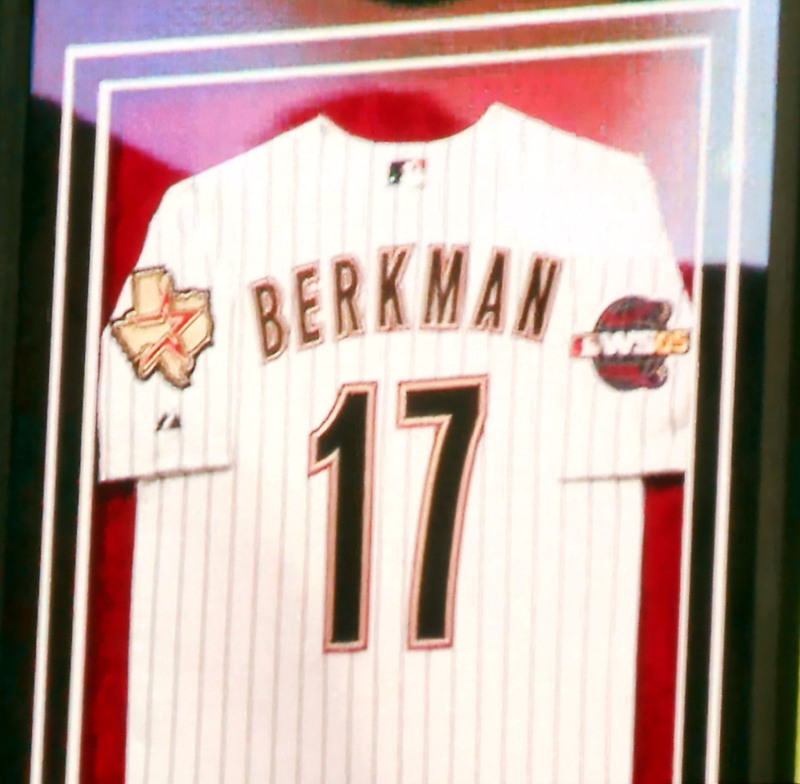 They will be honoring a player in Berkman who after graduating from Rice University, played a dozen seasons in Houston before spending the final three years of his career with the New York Yankees, St. Louis Cardinals and Texas Rangers. Of course getting traded away from the Astros was not a completely bad thing as Berkman earned a World Series ring during his time in St. Louis but something tells me he would have preferred winning it with the home town team. Berkman was voted to the All-Star Game six-times and hit .296 with 326 home runs and 1,090 RBIs over his 12 seasons with the Astros. He led the National League in doubles in 2001 and again in ’08, while also leading the NL in RBIs in ’02, when he finished third in NL MVP voting. As for the all-time Astros records Berkman ranks first in slugging percentage (.549), second in home runs, third in RBIs, walks and runs scored, and fourth in games played. Sharing the retirement stage with Berkamn will be Roy Oswalt who was the ace of the pitching staff for the Astros for many years and had the honor of being the de facto Opening Day starter for most of his years with the club. I never really followed Oswalt in the same way that I followed Berkman and will admit that his being traded did not affect me in the same way. But, I am sure that for many Astros fans at the time there was a great sadness felt when the announcement of Oswalt being shipped to the Phillies was made. Of course the Phillies was not Oswalt’s last stop of his career. 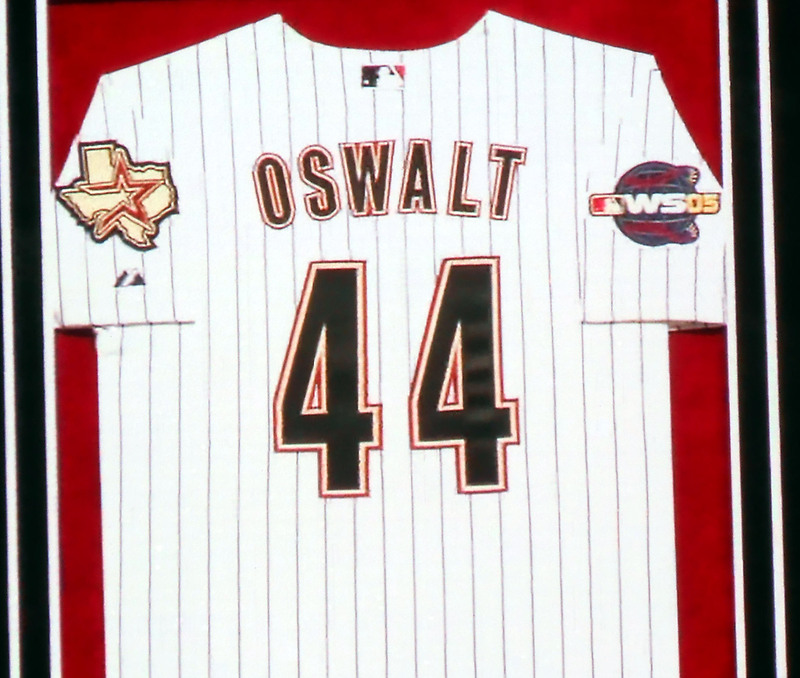 After spending his first 10 big league seasons with the Astros, Oswalt spent the last four years bouncing around with stints with the Phillies, Rangers and Rockies. Roy Oswalt helped guide the Houston Astros to the World Series in 2005, earning National League Championship Series MVP honors after going 2-0 with a 1.29 ERA in the six-game series victory over the Cardinals. That performance also earned Oswalt the gift of a bulldozer from then team owner Drayton McLane. 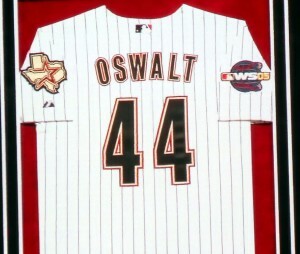 Oswalt will make one more appearance at Minute Maid Park before calling it a career. Oswalt finished in the top five of the National League Cy Young Award voting during five of his 10 seasons with the Astros. 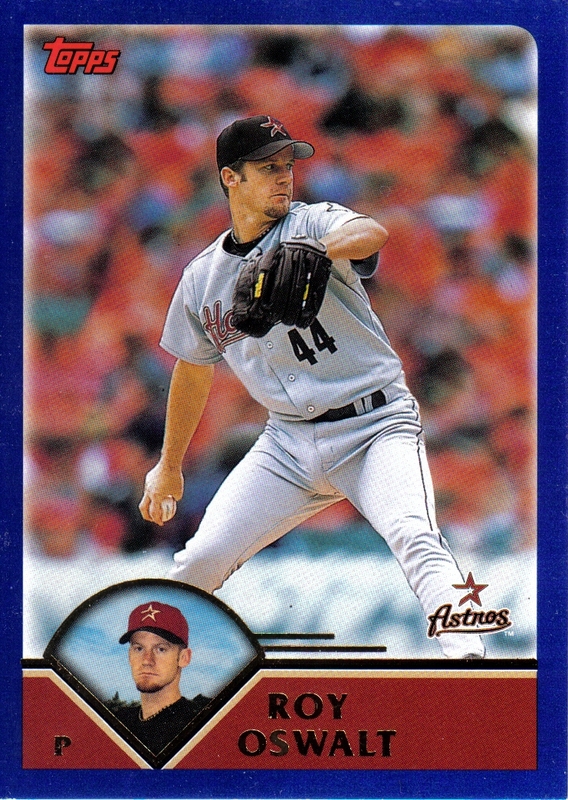 Oswalt recorded back-to-back 20-win seasons in 2004-05 and finished 143-82 with a 3.24 ERA during his time with the Astros. 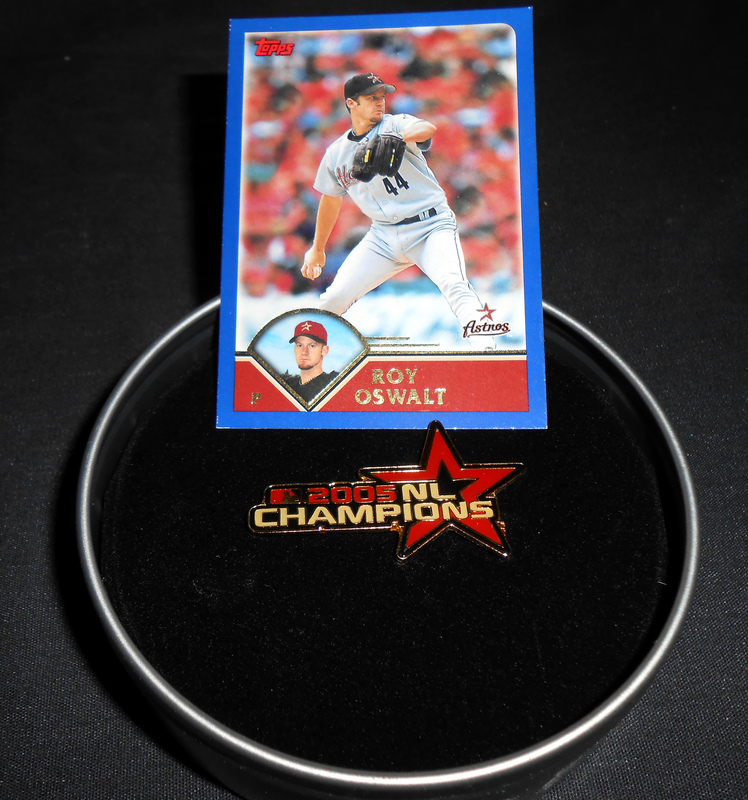 As for that last trip to the postseason for the Astros, Oswalt helped guide Houston to the World Series in 2005, earning National League Championship Series MVP honors after going 2-0 with a 1.29 ERA in the six-game series victory over the Cardinals. That performance also earned Oswalt the gift of a bulldozer from then team owner Drayton McLane. Oswalt finishes his career as the Astros’ all-time leader in win percentage (.636) and ranks second in both wins and strikeouts. There is little doubt that the time for both men to retire has come. One could probably make the case that they should have retired at least a season or two ago as injuries turned both men into a shell of their former selves where performance at the plate and velocity on the mound just wasn’t what it used to be. Of course it is hard to decide when to hang up the glove for good when playing baseball is all one has ever known. As for their post baseball lives Oswalt is going to work for his agent as a vice president and Berkman has been mentioned as a possible successor to Rice Owls coach Wayne Graham. In the meantime there is one more plate appearance at Minute Maid Park awaiting both men so that their careers can end where they began. Chances are there won’t be a dry puma eye in the house. 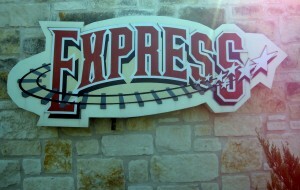 Now if you’ll excuse me, I’m off to get some tickets for the farewell to Berkman and Oswalt game.